In addition to the client GUI application, SyncBreeze Server includes a command line tool allowing one to execute file synchronization commands from an OS shell window. 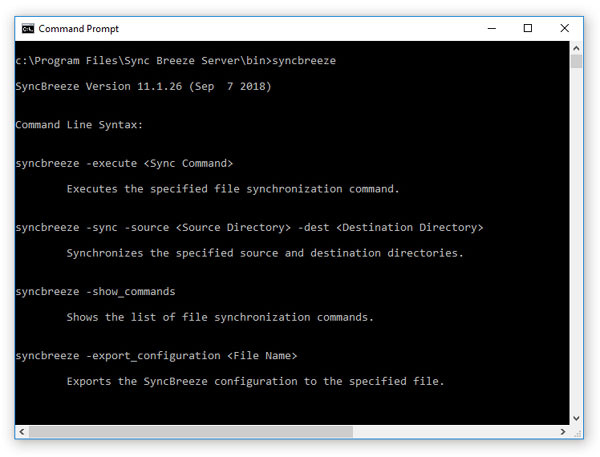 The SyncBreeze command line tool provides power users and system administrators with the ability to integrate file synchronization capabilities into batch files and shell scripts. The SyncBreeze command line tool is located in <ProductDir>/bin directory. Shows the SyncBreeze server status. Shows file synchronization commands defined in the SyncBreeze Server configuration. Adds a new file synchronization command. Synchronously executes the specified file synchronization command on the SyncBreeze server. Asynchronously starts the specified file synchronization command on the SyncBreeze server. Pauses the specified file synchronization command. Stops the specified file synchronization command. Disables the real-time disk change monitor for the specified file synchronization command. Disables periodic file synchronization for the specified file synchronization command. Enables scheduled file synchronization for the specified file synchronization command. Disables scheduled file synchronization for the specified file synchronization command. Shows the status of the specified file synchronization command. Shows the Sync Breeze Server debug message log. Clears the SyncBreeze server debug message log. Sets the server user name. Execute this command locally to reset the user name. Sets the server password. Execute this command locally to reset the password. Sets the server control port (default is 9121). After changing the port number restart the server to apply changes. Sets the default server host name, port, user name and password to connect to.